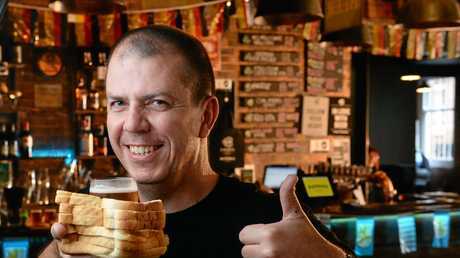 A QUEENSLAND brewery has launched a beer made from bread. It's a first for Queensland and if you want a taste, you'll have to be quick. There's only 1050 litres and the brew is a limited edition. Ipswich's 4Hearts brewing used bread that would have otherwise gone to landfill to make the new beverage called Daily Bread. The new beer was launched tonight to coincide with the start of a three-day waste conference being held at the North Ipswich Workshops Rail Museum. 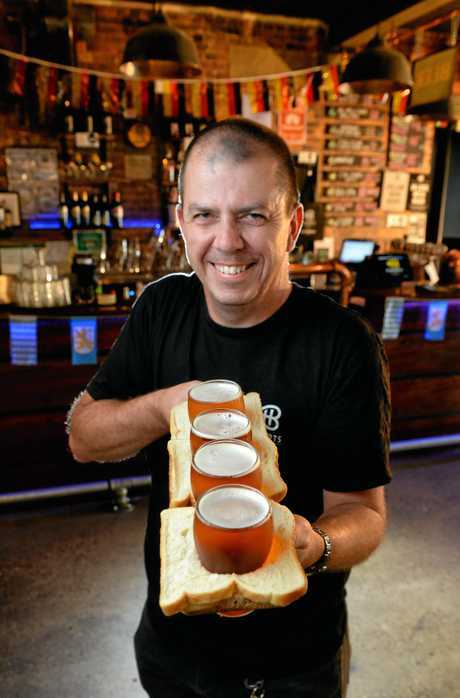 Head brewer Kenneth Friend said 80kg of bread was chopped into tiny cubes, toasted and mixed with malt to make the 4 per cent Belgian-style ale. He said the idea for the name came from monks. "Belgium monks brewed beer in the monasteries for Lent," Mr Friend said. "They weren't allowed to eat, but they were allowed to drink beer to sustain them. "The idea is getting their daily bread through the beer, hence the name Daily Bread." 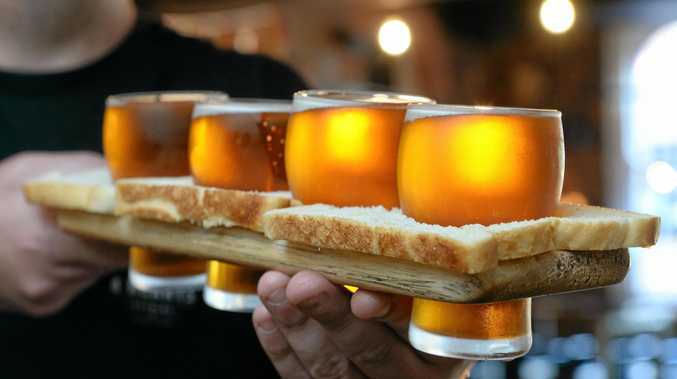 The beer was designed to show how food, such as stale or unsold bread, could be repurposed instead of going to landfill. And that's not the only way Ipswich's boutique brewery recycles; it also donates spent grain to farmers in Pine Mountain to help feed a small flock of sheep. "Just because something has hit its expiry, doesn't mean it's a product that can't be used anymore," Mr Friend said. Daily Bread will be served tonight at a meet and greet for the waste conference and will be released to the public, at the Pumpyard Brewery on 88 Limestone St, in the coming days. A GROUNDBREAKING convention focusing on solving Queensland's waste issues is under way at the Workshops Rail Museum in Ipswich. The three-day event, Future Waste Resources Convention 2018, will focus on the future of waste and recycling. It is the largest event of its type ever held in Queensland and began last night. More than 250 people registered to attend. including key stakeholders, such as waste companies, the waste industry, researchers and state and local government representatives. Topics covered will include the potential for energy from waste facilities, maximising existing waste streams - such as turning discarded or unsold vegetables into highly nutritious meals for the elderly, and plastics and recycling in construction. 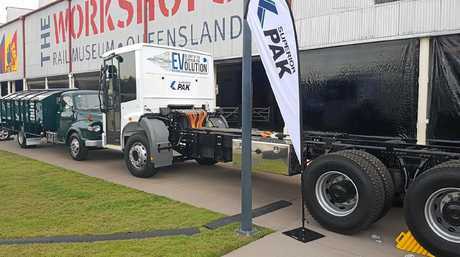 NEW AND OLD: Two waste trucks side by side; the green one is one of the oldest Queensland rubbish trucks still on the road, while the one on the right is a new, electric battery operated waste truck made by Superior Pak, a company in Bundaberg. Head of Waste Recycling Industry Queensland Rick Ralph said it was essential to bring leading stakeholders together, to honestly discuss the industry's challenges and brainstorm solutions. "This is about what is possible and what is achievable in the future for this industry," Mr Ralph said. "We will be looking at generating energy from waste and, very importantly, we will be looking at how to make kerbside recycling, and recovery of post-consumer products more sustainable." Plans from waste company Remondis to build an 'energy from waste' facility in Ipswich will also be discussed at the conference. The waste industry is experiencing a crisis, triggered by China's decision to stop accepting recyclable plastics from around the world. That crisis was most clearly highlighted in Ipswich when Ipswich City Council sensationally announced it would send all recycling to landfill, after negotiations with its contractor broke down. The recycling program has since been reinstated. It's not just China's decision that will impact the waste industry either. Early next year, the Queensland Government's $70 per tonne waste levy will go live, increasing costs on an industry already grappling with major change. The more waste is diverted from landfill, the less rubbish will go into the ground, the less fees that will attract from the incoming levy, Mr Ralph said. See waste equipment and processes up close and learn more about the energy from waste proposal put forward by Remondis which plans to build an incinerator in Ipswich. Residents can also dispose of e-waste which will be recycled.